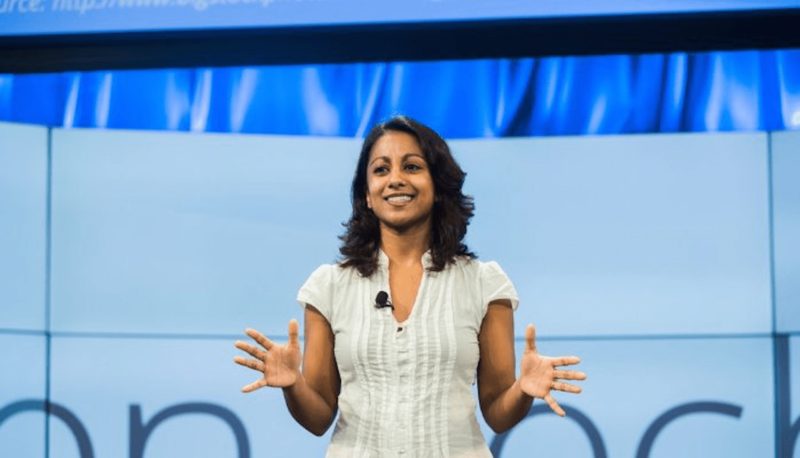 As a software engineer turned founder and someone who educates other tech professionals on how to do the same, Poornima Vijayshanker has seen the startup world from nearly every angle. I sat down with Poornima for a wide-ranging chat that covers the role of empathy in building product, what she learned in her transition from engineer to startup founder, how to advance your tech career through public speaking, and much more. If you like what you hear, check out more episodes of our podcast. You can subscribe on iTunes, Stitcher, or SoundCloud, or grab the RSS feed. Listening sessions and interviews are valid ways of developing customer empathy, but product builders can go much further by spending time in a customer’s actual work environment. At some point a founder who builds the product must share in co-creation to scale. In doing that, it’s crucial to recruit people whose strengths complement the founder’s weaknesses. New founders, both technical and non-technical, get wrapped up in product building. That’s no surprise, but as a result sales and marketing are put on the back burner. The earlier you ask,“Why would someone want to buy this product, and why would they want to buy it from me,” the better. There are huge benefits for founders who encourage their engineers, and designers to try public speaking. Not only is it a great way to recruit and facilitate the growth of your employees’ careers, but these events present a prime opportunity for face-to-face customer research. Adam Risman: Poornima, thanks so much for joining us. Can you give us the origin story of Femgineer? How did it grow from a personal blog to what it is today, more than nine years later? Poornima Vijayshanker: As far back as I remember, I’ve been writing. I would write a lot of short stories, and I even tried to pursue writing a novel. Somewhere along the way, I lost track of writing. It was around high school, when I started doing more public speaking. When I moved to the Bay Area in 2004, a lot of people were talking about blogging. One of my friends convinced me that a blog is a great way to have a public journal and just capture your thoughts. Maybe it would be useful to your career later on, people might reference it, read it and get a sense of who you are and the work that you’ve done. I thought it was a great idea, and around 2006-07 I started working on my blog. I wasn’t really sure what I was going to write about at the time, but I figured,“Why don’t I just write about what I’m working on?” At the time, I was the founding engineer at Mint, so I was working on engineering and entrepreneurship. Of course, I had to have a website and a domain name and – as you can imagine, Poornima Vijayashanker is just way too long and hard to spell – so I needed to come up with a moniker. I thought,“Well, who am I? I’m female, I’m an engineer, great, let’s slap that together,” and Femgineer was born. Adam: You’ve written frequently about the role empathy plays in building a successful software product. A lot of people hear that and think it’s compassion in the workplace, but it’s not just that. It’s actual empathy for users that bleeds into process for product development, customer support, etc. How can startups better understand their customers, while also aligning with teammates to actually build a better product that helps solve customer needs? I almost forced everybody to go and spend a day at a yoga studio. I had my technical co-founder do this, I had my designer do this, and as each person came back to me, they were amazed. They were like, “I didn’t realize that at the last minute all these students rush in and check-in is a big part of their process. I didn’t realize that not having enough students actually threatens the business and there’s this thing called memberships.” Yeah, I knew that existed, but I didn’t really see it through the lens of someone who had this experience. It really opened their eyes and it helped them to understand the workflow that we were designing for that particular use case. It comes down to understanding why the designer wants to make this thing pixel-perfect and why being pixel-perfect isn’t good enough. Yes, it’s important to get it to a point that they can be proud of their work, but you still have to build enough so that the engineer can do their work. That’s the engineer understanding the designer. On the flip side, you’ve got the engineer who comes back and says, “Okay, so what’s the error condition here, and what happens if they forget their password? What’s that experience going to be like?” The designer says, “Oh my goodness, there are so many scenarios. How many scenarios do you need?” The engineer has to take the time to express what their problems are. They might say, “You’re designing this UI with all this information, I have to go to the database, pull all the information out, and figure out a way to display it in the browser and still have a good performing product.” The designer needs to understand that. Ultimately, each side needs to talk about their particular problems in a way that they’re not saying things like, “I need to design this thing in Photoshop and it’s going to take me X-hours,” or “I need to go to the database.” If they can talk about it in the context of the business problem – or this is what we want to give consumers and here are some of the missing steps and problems I’m dealing with – they can come to a compromise and put that into the product and the building process. Adam: As employees come and go and the business scales, this kind of empathy has to be instilled in culture. You’ve spoked quite a bit about the rise of the DEO and the designer-founder. How have you seen these changes in leadership styles influencing this? Has design-led thinking made for a more empathetic workplace environment? Poornima: I have to credit the originator of the DEO moniker, Maria Giudice, who is the VP of Experience Design at Autodesk. There are six traits that she talks about, but I’ll boil it down to the couple I think are most important. This isn’t talking about a designer versus an engineer or a designer versus a marketer; it’s someone taking a design thinking approach versus the old command and control way that CEOs were operating. That change from command and control to more of a distribution in terms of who’s building, who’s making decisions, and how the company’s growing is really the change that’s happened. For that change to come about and to build that rich culture where people feel like they’re contributing, they’re being valued for their contributions, and they’re able to meet their business goals, the first trait is co-creation. A lot of these companies start off with the founder actually building the product. They have this vision, they put out the initial version, and they’re proud of it, but at some point in time, they realize it’s not good enough or they want to get to the next level. They need to recruit more people and they need to share that co-creation so it’s not that they’re the only ones who can create or design a product, but there are other people coming to the team that each have what Maria calls a superpower, as well as kryptonite. Not to stereotype, but an engineer’s kryptonite might be messaging or copyrighting and that might be a marketer’s superpower. You need to collect all of this together in order to build that end product, and the DEO is thinking in terms of, “Okay, we are now going to co-create, not we’re going to micro-manage.” They set up a framework that other people can operate. The second is having systems-level thinking. It’s not just the old way of needing to add value for shareholders and that’s what matters, but instead thinking, “The work we do impacts our employees, our customers, and our community.” Of course our investors matter, but they’re not the only group that matters. To be able to service all those people really requires system-level thinking. One of the final traits that’s really important is emotional intelligence. This is something a lot of people struggle with, not because they don’t care but because it becomes less of a priority. The priority instead is fundraising, then having to monetize, and then exit. The end goal is always focused on one particular thing and as a result we have this sink or swim mentality. In order to hit that goal, we have to be intelligent, we have to understand how our employees feel, we have to understand how our customers perceive our product and our brand, and of course, we still have to consider what our investors want. It’s not that we leave them out of the equation. That takes a level of emotional intelligence, which is being aware of our surroundings, understanding the people practicing empathy. Designers have been trained to do this, so it becomes an additional trait in their leadership. Adam: Most of our listeners are early-stage startup folks, and they’re trying to figure out how to position their product. How can they effectively use design to inform their positioning, and is there something key that they should be designing, too? Is it usability, is it trust, is it a combination of a lot of things? Poornima: What are you trying to do in the market? Going back to my days at Mint, there were already a handful of money management tools. There was Quicken, Microsoft Money, and some smaller startups who were getting started. It’s not like consumers lacked choice, but maybe they were unhappy with the choices that were out there. The discovery process for us was, who’s actually unhappy enough with these products that they’re willing to switch? What’s it going to take for them to switch? Some people might be unhappy but say, “At least I know what’s going on here. I’d rather just stay with the tried and true and trusted than try something risky.” Who wants to give a bunch of 20-somethings sitting in Silicon Valley the username and password to their bank accounts? Digging into the demographics of the people using Quicken, they tend to be affluent, older, and really value trust and security. As a young company starting out, trust takes time to build. Security certainly takes time to build, and going after this demographic might prove to be a problem because they’re they’re kind of unhappy, but maybe satisfied. So if we can’t go after that demographic, who do we know that we can go after? We started to see this emergence of 20-30-year-olds, basically millennials, who really cared about their finances. They were budget-conscious, they were paying off student loans, they’re trying to make ends meet, they had all these financial goals, but they weren’t sure how to do it. For them, the growing frustration was, “Why can I bank online, but I can’t actually see all of my finances?” We knew there was some behavior change going on in the market and some people were more adapt to it, and others weren’t. Given that, how do we cater to this group? They don’t want to spend time, they don’t want to spend energy, and they want everything to be push-button. For us, a lot of the design focus was on automating everything – pulling in your transactions, showing all the graphs, making it so all you literally need to do is enter your username and password. That brings up the question of trust. Just because somebody’s young doesn’t mean they are stupid. We still had to do a lot in terms of gaining people’s trust, so that got conveyed in the design and in the messaging. It wasn’t just designing the experience; it was also designing the interface to convey that level of trust, because at the end of the day, if there is a snafu, then these young folks who are a lot more vocal on social media are going to blast us. That was really another key part. For us, the design wasn’t just one element, it was multiple elements. Ultimately, that’s how we developed our position in the market. We thought through all of these factors and realized it wasn’t just one thing. Adam: I’m sure Mint was a huge learning opportunity for you, not just on the software development side but in a lot of aspects of business that ultimately helped inform your career switch from engineer to founder. Looking back, what advantages did your technical background give you when you decided to make that leap, and where did you find the more difficult learning curve? Poornima: The first thing is people don’t BS that much because they know you’re technical and they know you’re capable of building. When I was recruiting employees or talking to people, there was definitely a level of credibility that I had. If I had been a business founder or had not worked at Mint, I wouldn’t have had that. Investors were willing to take meetings with me, people who I’d e-mailed to try to recruit were responding to my e-mails and willing to interview. That was a big advantage. Adam: You were able to leverage that past technical experience? Poornima: Exactly. That was important to do because what else do I have? For the people listening who feel like they don’t have a level of leverage, really dig in and understand your background. Even if you have a level of domain expertise, whether you’re technical or not, that is something really worth advertising and marketing. Adam: Through Femgineer you’re educating aspiring founders on many different business elements. I’m sure all these folks are super eager to get something shipped, even if they probably know it’s nowhere near the finished product. How do you get them to slow down and make sure they’re covering all those bases that you talked about, particularly those that have maybe less experience on the technical side. Where do new founders tend to rush? Poornima: I didn’t answer the second part of your last question – what was harder for me to do. I’ll explain, and it’ll lead into the second question as well. What was harder for me to do was sales, because as an engineer, what gives you the greatest sense of satisfaction is building and shipping and then hearing your customers. Whether it’s positive or negative, knowing someone is using your product is the greatest source of motivation and accomplishment. When I went from being an engineer to a founder, I didn’t stop coding altogether, but I had to stop coding everyday. Over time I coded less and less and eventually I hired a technical co-founder. That left me with managing the product, and doing sales and marketing. I’m a decent writer, but I am certainly not a marketer or a salesperson. In fact, I struggled with doing sales for the first year. I not only needed to learn how to do sales, but I also needed to learn how to recruit salespeople. I put myself through a boot camp where I learned how to do sales and over time became a lot more effective at it. The awesome thing about sales is, much like engineering, it’s a process. There is a logical structure, and if you follow it you will actually make sales. That was a challenge because initially you don’t see anything. You’ll go through ten phone calls or twenty meetings and people will either be indecisive or say no, so there’s a lot of rejection. When you’re an engineer, there’s not really a whole lot of rejection. Yeah, there are some bugs people will gripe about, but overall, you’re not getting rejected over and over again like you are in sales. I had to come to terms with that and understand it’s part of the process. Now the reason I say this is important is because you asked where do you see founders today not putting a lot of time and energy into. It’s actually the sales and marketing. Both technical and non-technical people, they get so wrapped up in the how. “How am I going to build this? Should I go web versus mobile, or should I do VR now, or should I do a smartwatch?” They get so caught up in the technology that they fail to ask themselves, “Why would somebody want to buy this product?” Not only why would they want to buy this product, but why would they want to buy it from me, and why now? These are some of the fundamental questions that I push people to ask themselves over and over again because it will ultimately determine their activities: putting more emphasis into sales and marketing and not just product development. Yes, it’s important to have a product and a prototype and get it out there, because that’s what people are going to use. Failing to develop an audience and get customers onto the platform ultimately means that you don’t have a business. Right now we’re going through this process in The Valley where people are asking themselves, “Was this all a bubble?” People aren’t doing as much investment, how are all these unicorns going to make money? This is another reason early-stage companies really need to be thinking about controlling their own destiny. That might mean bootstrapping for 6, 12 or 18 months, that they may or may not get that bridge round of investment that they wanted or that series A or series B, so how are they going to stay in business? They’ve got to figure out what to build to appeal to those customers and how to market it. A lot of the challenges that we’re experiencing today come back to us asking ourselves, why would somebody want to buy this from us and why would they want to do it now? Then, okay, how do we manifest that into a product? What are the features that we need to build? Adam: One way to get the message out about how you think about and build product is through public speaking and appearing at events. You speak at conferences across the globe and recently co-wrote Present: A Techie’s Guide to Public Speaking with the former Adobe VP and fellow diversity in tech advocate, Karen Catlin. Why is it so important for technical folks to put themselves out there and share their expertise? Poornima: The most authentic way to showcase yourself is not to have other people talk about you and say amazing things, but to actually get up there and showcase your work. Talk about what you built, what your contribution was, the problems that you faced, and through this there’s an element of teaching. Someone who is less experienced or curious about the topic is going to going to learn a lot from you. They’re going to fast track their learning, avoid those mistakes you went through. It actually gives them a lot of value. I started speaking in middle school and high school for debate because I was a shy kid and I realized that life was going to be really hard, so I decided to do that in the most awkward years of my life. In engineering school, I didn’t have time, so I returned to it when I started working at Mint. I thought, “I’m signing up for this conference, and I’m doing it because I want people to know about Mint. I want them to know how we built it, and let’s see where it goes from there.” Yes, I started to develop a following from that, but people also came up to me and said, “Are you hiring?” Yes, of course, there’s a war on technical talent. A lot of people would prefer to come up to me and talk to me as the person building the product or the company versus a recruiter, because they felt like there was a misalignment. They don’t feel like they’re representing the company. Somebody working on the inside who’s building the product, that’s somebody to learn from and get coaching from, and that’s who people want to work for. It’s incredibly important for recruiting alone that people send technical talent and not just their marketers and salespeople and recruiters out to speak. Aside from the recruiting side there’s also customers, and customers feel very similarly to employees and candidates. They want to know who the makers are and why they’re motivated. If you’re in a B2B business or you’re building a product that’s for developers or designers, API-style businesses like Twilio, for example, it’s incredibly important that you have a conference and you get your makers – meaning your engineers, your designers – to go out and speak. That’s who customers want to be talking to and it’s a great way to do customer research face-to-face. Adam: That’s great, but is it as simple as jumping in the deep end or is there a way to wade your way into it? Poornima: I was shy, and a lot of people are shy or introverted, especially designers and technical folks. I’m not saying that’s indicative of everyone, there are certainly a lot of extroverts out there, but for those who might worry, they worry about a number of things. They worry about what they look like, how they sound, whether they’re an expert or not. If you want to take a baby step start by giving an internal presentation, and talk about what you just built or what your team just built. This is also a great place to onboard new employees. Use that as a stepping stone and then from there think about applying to speak at your local conference, or go to a meet-up. Meetups are always dying for speakers. It’s another great place to get started. Now let’s talk about the other issue of, “I’m not an expert.” It’s not about being an expert. People are coming out because they want to hear about your experiences and your perspective, otherwise they would just stay at home and read a book or do a Google search. The reason they’re coming out is they want to know the pains that you went through. Adam: Going back to this idea that one of the barriers is attending conferences and not seeing people with similar professional backgrounds or personal backgrounds. Why is diversity at tech events lagging so far behind? Is there an obvious path to improve it? Do organizers tend to rely on the same connections over and over, so they’re not necessarily digging for fresh voices? Poornima: It’s really hard to put a conference on. I give them credit, it is hard to put a conference on, to get the sponsorship, to run it smoothly, so often finding speaking talent is sometimes the lesser of those priorities. So at the end of the day, “Hey, my friend Bob, he can show up and give a talk”, “Great, is Bob capable of speaking?” “Yes, he’s spoken at the last conference, check out his YouTube video.” Done. That’s often what happens versus, okay, we need to be thoughtful about picking all of our speakers, there needs to be a balance in terms of voices, that’s going to take time, that’s going to take energy. It’s a challenge. Ultimately, it means that organizers have to try harder. They have to try harder when it comes to recruiting, but they also have to try harder when it comes to identifying the voices, persuading people to step up. As a result, you see the same voices, you see the same people speaking over and over again, which is why we wrote the book. We wanted people to get over that level of shyness or introversion and that fear, and give them some baby steps and make them realize this isn’t any harder than building a product. In fact, a lot of the methodologies that we talk about are analogous to building a product. The main difference is, in one case, you ship it and you don’t really see people; in the other case, you’re standing in front of people and you have to come to terms with that. For people out there who might have been given an opportunity to speak, and the only thing that is holding them back from getting up there and getting on stage and speaking, is to think about what you want tech to look like in the next five to ten years. Who do you want to be working with, who do you want to hear as voices? If you can inspire one other person out there, then that’s worth getting on stage and getting over your fear. That’s important to put in that context. Adam: Awesome. Hopefully, we’ll have a few new storytellers from listeners of this show. Thank you so much for joining us today. Poornima: Great, thanks for having me, Adam.